We open and close our garage doors several times a day and barely give a passing thought to the little machine that powers it all. In fact, most of us only really think of our openers if something suddenly goes wrong and we can't get our door to open all of a sudden. In general, these units are dependable most of the time but it is a good idea to understand the possible problems that can arise and what to do when something goes wrong. All of these malfunctions have their own specific set of symptoms and some issues are more common than others. If your garage door won't open or close all the way, or it comes down only to go straight back up again, there may be a problem with the switches that determines the limit your opener is set to for opening and closing. If this is the case, our technicians can help adjust these switches to the correct limit. If your unit makes horrendous sounds each time you open or close your door, there is a possibility you have a worn drive gear. This gear will continue to work while emitting those awful noises. However, when it finally gives away, it will usually happen when you least expect it and at the most inopportune time. Never ignore these nasty sounds, even for a short period of time. If your gear is making creepy sounds, contact us to arrange an appointment right away. The most common malfunction with your opener is a problem with the remote. If you can't get the door to open using the one you have, you can test the opener's responsiveness by trying to open the door using the wall panel. Similarly, if you have multiple remotes, try one of the other ones. If the other controls work, you may simply need to change the battery in the remote, or obtain a completely new remote. This is generally the most common problem, and fortunately it is also the one with the simplest solution! If you go to open your door using the switch at the wall panel and the door won't open, this indicates a problem with the unit itself. It could be an electrical or wiring failure or a problem with the motor. 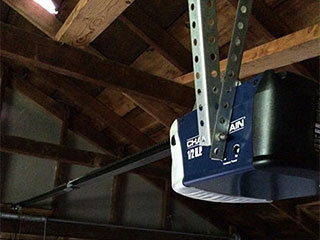 Whatever your opener malfunction, our experts at Garage Door Repair Texas City can resolve it. Contact us today to make an appointment or find out more about our repair and replacement services.